This heavy duty mixer is built to produce incredible milk sakes, malts, other ice cream drinks. Also great for flashing drinks, whipping eggs, and mixing batters. It has high-performance 1-peak hp motors, three speeds, pulse, and fully automatic start/stop operation. The timers allow the operator to set the machine to stop when desired. Built with a heavy-duty die-cast housing. It ships with three bonus stainless steel malt beverage cup included. Includes three solid and three Butterfly agitators. The motors are easily user-replaceable. 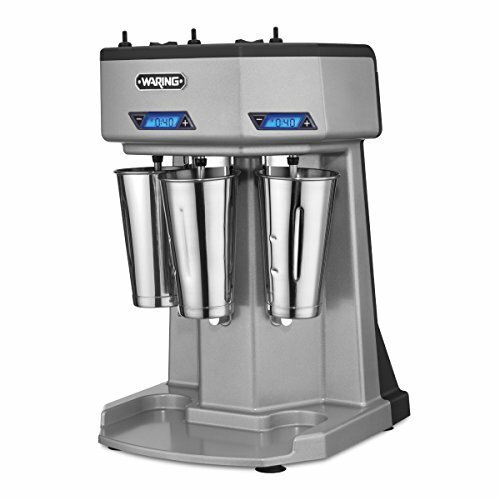 View More In Commercial Mixers. If you have any questions about this product by Waring Commercial, contact us by completing and submitting the form below. If you are looking for a specif part number, please include it with your message.